Struggling with an ant problem? Dealing with an ant problem can be extremely frustrating! They seem to appear from nowhere and are impossible to control. Whether it’s black ants in the house, ants in the lawn or ants digging up your pavers, AllPro pest control have a range of specialist ant treatments to solve your problem. Why do I need a professional ant treatment? They are difficult to control due to their nest structure, behaviour and large numbers. A simple spray may kill the ants you hit, but it is unlikely to kill the nest, meaning the problem will return. At AllPro Pest Control, our knowledge of the different ant species and range of specialists ant control products, means we guarantee to solve your ant problem. If you are struggling to get rid of your ant problem give us a call for a FREE QUOTE. Why trust AllPro Pest Control to solve your ant problem? Although our general pest control treatment provides 6 months protection from internal ant problems, if you have an established ant problem inside the house, or problems outside the house (in the lawn or pavers), you will need to consider one of our specialist ant control treatments. Broadly speaking, ants cause problems around the home in three different areas; inside the home, around the perimeter of the home and in the lawn. We have developed our ant control treatments for these locations, which we further modify depending on the ant species present. Ants often come inside looking for food and moisture, but certain species also like building their nests inside too! Roof voids (they love insulation) and wall cavities are warm, dry and safe nesting places. Before we start a treatment we spend some time trying to locate the nest (or nests!) as this can impact our ant control treatment. As we try to minimise spray treatments inside the home, indoor ant treatments rely heavily on ant baits. Ant baits consist of a food matrix and a slow acting insecticide. Foraging ants find the bait irresistible and take it back to the nest where it is spread throughout the nest, killing the queen and the colony. We may also use insecticide powers and the treatment often involves an ant spray treatment around the perimeter of the building and ant entry points. These perimeter spray treatments also provide long lasting ant protection, by preventing new ants entering. Our indoor ant treatments come with a 6 month warranty. Ants around the perimeter of buildings are not normally a nuisance until they start to take over your outdoor entertaining areas or building their nests under pavers, undermining your paths and driveways. If their numbers build up there is also the chance they will start coming inside looking for food and moisture, so it’s best to get on top of any problem before it gets out of control. Control of outdoor ants often requires a combination treatment of sprays and baits. As the outdoor species often have large colonies with multiple nests and queens, sprays are vital for getting the ant numbers down. 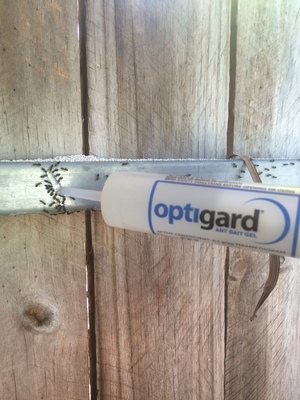 The sprays we use are special non-repellent sprays designed for maximum ant control. The non-repellent nature means that ants walk across treated areas rather than being repelled. Not only does it kill the ants that come into direct contact with the treated surface, but it also gets transferred from one ant to another, maximising its effect and potentially killing the whole colony. Depending on the ant species, baits are used to target the queen and larvae back in the nest, essential to eliminating the colony and getting lasting control. Often we will use granular baits spread over the infested area. Our outdoor ant treatments come with a 6 month warranty. After this, new ants may move into the treated area. As such, with outdoor ant problems it may be necessary to have treatments once or twice a year. 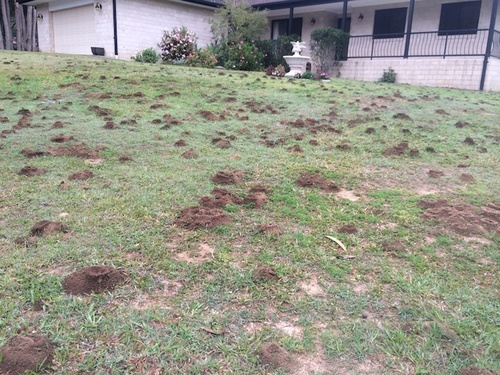 Although there are a number of species than can cause problems in lawns across the Redlands and wider Brisbane area, most of the problems are caused by funnel ants and green headed ants. These two ants cause very different problems for homeowners and require very different ant control treatments. Most homeowners in Brisbane will have come across Green ants (or Green-headed ants), which tend to build their nests in lawns. As we all know, they can deliver a very painful sting that can itch for days afterwards. What many do not know, is that some people suffer life threatening allergic reactions that require immediate medical attention. If you have Green-headed ants in your lawn, you should certainly take action, especially if children or pets are around. 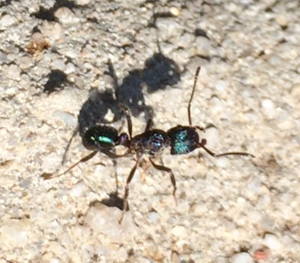 Our Green headed ant control programs involve treating the affected area with a granular bait, which is very effective in controlling the colony. Once your property is clear of Green headed ants, it should remain clear for a number of months. AllPro Pest Control are pleased to offer a 6 month warranty. GREEN-HEADED ANTS ARE A PAINFUL INVADER OF GARDEN LAWNS! However, it is more than likely that neighbouring properties also have Green headed ant infestations. Eventually these ants will re-invade your lawn, meaning a treatment once or twice a year may be required to keep your property ant free. Of course if you can convince you neighbours to get their lawns treated at the same time, the results will be long lasting (and we can probably provide a group discount as well!). Across Brisbane there are certain suburbs where the lawns look like lunar landscapes. These dirt ‘chimneys’ are the work of funnel ants. Although funnel ants are rarely seen, they build their extensive nests underground, where they feed on aphids attached to the grass roots. Their presence is only detected when the mysterious ‘funnels’ appear overnight, normally after rain. Underground they are undermining the whole soil structure, making the ground uneven, which can result in damage to lawn mowers and injuries (twisted ankles and more). Funnel ants in the lawn of a house to be sold can result in a significant drop in the selling price. As badly effected lawn may also need to be leveled after treatments, it’s best to have the lawn treated as soon as they start to appear, before significant damage is done. 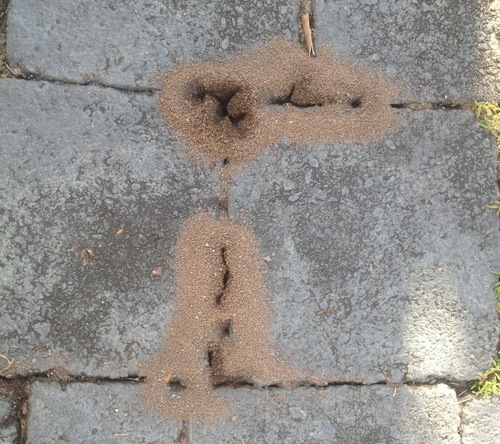 FUNNEL ANTS ACTIVITY IS UNISIGHTLY AND CAN IMPACT PROPERTY VALUES! There are no ant baits that are effective on funnels. As such, our funnel ant treatments require treatment of the whole lawn. This gets the insecticide into the soil, which the ants pick up when they are doing their excavations. The treatment kills the colonies and leaves some residual insecticide in the soil, to prevent new ants moving in. This is a very effective treatment and we provide a 6 month warranty (but can last longer). More information on funnel ants… Lawn treatments for Green-headed ants and Funnel ants are based on the area of lawn to be treated, so when you phone for a quote, please have an estimate of the area to be treated (m²). Why are ants so difficult to control? To get lasting control of ants you need to be able to identify the individual ant species, as they all have different nesting habits and different foraging behaviours. This information impacts the ant control strategy and correct product choice. Critical to success in providing lasting control of ants is the need to kill the queen. Generally this cannot be achieved with a quick spray from a supermarket product. Lasting control requires the combination of specialised ant spray products and ant baits, which can kill the queen and larvae back in the nest.